Finding, shaping and sharing your story can empower you to deliver meaningful anecdotes, that elevate health statistics, reveal the importance of your mission, and inspire people to action. 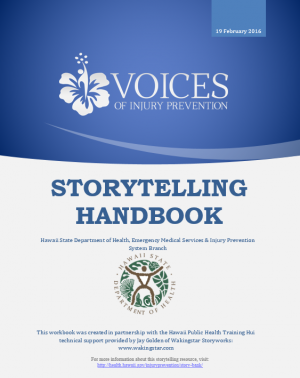 This Storytelling Handbook is intended to help you find, shape, and share your injury prevention, safety, or wellness story. You can use this this self-paced tutorial/ handbook to write your story. The handbook provides tips, techniques, and templates as support to the story you would like to tell. It will take a little bit of reading, some development, testing, and refinement to get it right. Once you develop your story, we hope your intended audiences (i.e., public heath leaders, professional funders, co-workers, community members, family, and friends) will benefit from the very valuable asset and resource you contributed. At a later time, you can choose to contribute your story to the online Story Bank. This Story Bank is an ongoing resource directory and educational bank of inspiring and impactful stories in Hawaii that are used to promote injury prevention, safety, and wellness throughout the life-span and in all areas of safe living. These stories are housed on the Department of Health (DOH), Emergency Medical Services & Injury Prevention System Branch (EMSIPSB) website for ease of access to the public. Once completed, please upload your completed Handbook (PDF) using the electronic form below. For convenience, you may also complete and upload the Storytelling Worksheet (word file)! 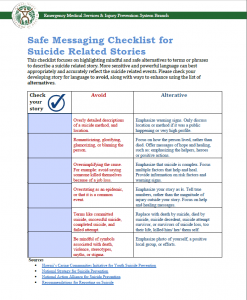 This checklist focuses on highlighting mindful and safe alternatives to terms or phrases for describing a suicide related story. This resource includes language to avoid, along with ways to enhance using the list of alternatives. Note: Only a personal portrait will be accepted. You acknowledge that the portrait is only of yourself. 1) The editors of the Voices of Injury Prevention project reserve the right to edit, review, approve and publish online your submission and publish. 2) You approve the uploaded photograph to accompany your submitted story. 3) Hawaii State Disclaimer - The contents of your story are solely your responsibility as the author and do not necessarily represent the official views of the Hawaii State Department of Health.